Add a shelf to any setting with this easy to assemble Aeon Multimedia Stand. Perfect for computer monitors, small TVs or A/V components. 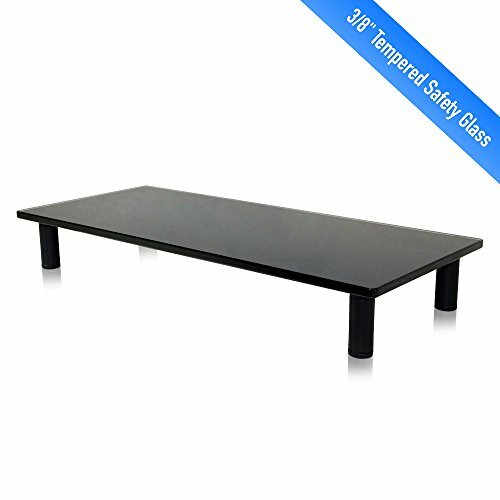 Tempered 10mm glass is strong and safe for your devices. Safety tested to four times it's rated weight of 100 lbs - the Aeon benchmark. Easily assembled in 5 minutes or less, add component storage to your computer monitor or TV in no time! Allows 3" of space underneath, perfect for a laptop, DVD/Blu-Ray player, Gaming console or small amplifier. Adjustable legs allow the Multimedia stand to be leveled or raised slightly.